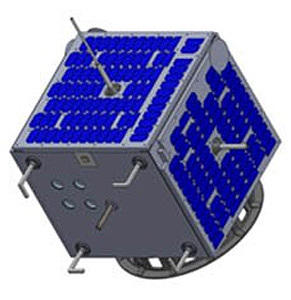 Payam-e Amirkabir, also known as AUTSAT (Amir Kabir University of Technology Satellite), was an iranian microsatellite for remote sensing and store and forward communications built by the Amir Kabir University of Technology (AUT). The satellite carried an imager with a ground resolution better than 40 m. A communications payload was also on board. It has been designed by the resident scientists and researchers at AUT. AUT and Iran Aerospace Industries Organization signed a production agreement on AUTSAT satellite. The satellite’s total weight is 90 kilograms and can be used to assess damages inflicted by earthquakes, droughts and other natural disasters, contributing to the reduction of casualties. The satellite is also capable of surveying agricultural lands. The satellite was launched on 15 January 2019 on a Simorgh rocket, but failed to reach orbit due to a failure of stage three of the launch vehicle.